Introduction to the "Green Algae"
The "green algae" is the most diverse group of algae, with more than 7000 species growing in a variety of habitats. The "green algae" is a paraphyletic group because it excludes the Plantae. Like the plants, the green algae contain two forms of chlorophyll, which they use to capture light energy to fuel the manufacture of sugars, but unlike plants they are primarily aquatic. Because they are aquatic and manufacture their own food, these organisms are called "algae," along with certain members of the Chromista, the Rhodophyta, and photosynthetic bacteria, even though they do not share a close relationship with any of these groups. The above picture shows a dense growth of sea lettuce (Ulva), growing in a tide pool at the Berkeley Marina. 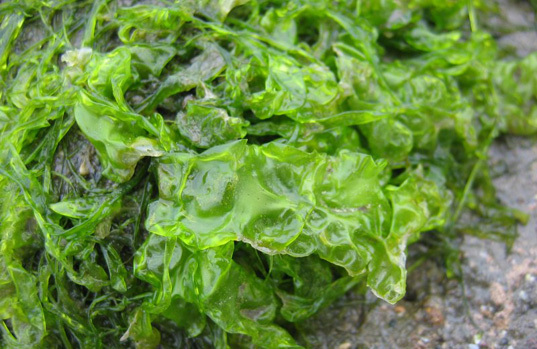 This is a marine species of "green algae" often found attached to rocks, and exposed at low tide. Visit the Gallery of Prehistoric Seaweeds for an overview of marine plants that lived between 700 and 400 million years ago . Click on the buttons below to find out more about the "Green Algae". Visit Wisconsin for pictures of various green algae, or try the Protist Image Data Base for information about Chlamydomonas, Tetraselmis, Halosphaera, and Pyramimonas, which are all "green algae". Additional images of green algae are available from Tavole di Botanica sistematica. Duke Univeristy maintains the Chlamydomonas Genetics Center, which includes databases and educational material.